My name is Dr. Steven Vold, and today I'd like to talk to you about glaucoma. 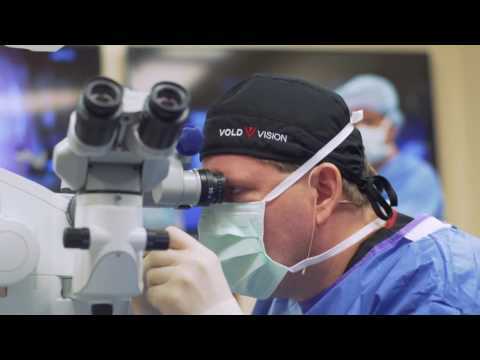 Hearing that you or someone you love has glaucoma can be a very difficult experience for many people, but in this video, we are going to try and demystify this experience and let you know that you are in good hands, and the leading medical minds have been working tirelessly to make suffering from glaucoma a thing of the past. Our number one goal is to stop glaucoma in its tracks, so take a few minutes with me to find out how that might be possible. We all have that faucet in our house that just won't stop leaking or that drain that just slowly gets clogged. It's so slow that no one really seems to notice much. Well, that essentially is what is happening in someone's eye, when they have glaucoma. The eye slowly starts to not be able to drain the internal fluid in the eye, which can eventually lead to damage of the optic nerve. The optic nerve is the eye's main transmitter to the brain. It's kind of like the film in a camera. This buildup of fluid is slow and painless, and so, for many, it can go unnoticed, but, over time, this damage to the optic nerve is what can create loss of sight. That's why it's so important to open up the drain, before any damage sets in. What can we do about this horrible disease, before it needlessly takes our sight. The answers that have been found through medical research are astounding. The primary goal is to lower what is called IOP or intraocular pressure. Essentially, doctors are trying to alleviate all that pressure that excess fluid has built up in the eye. Decreasing the pressure has proven to stop the progression of glaucoma. That is why finding it as early as possible is so important, as we still do not have a cure for the damage that has already been done. The good news is that there are many different treatments for lowering the intraocular pressure of someone with glaucoma. First is the option to use a medication that can decrease the amount of fluid produced by the eye or actually help the fluid get out of the eye. Now, the great thing about these new medications is that they have a targeted approach toward what is going wrong in the eye. They can avoid putting the eye through unnecessary duress of surgery, and they are primarily administrated through eyedrops, so they are generally safe, in terms of any side effects. In general, these therapies are a great breakthrough in the fight against glaucoma. Another therapy to reduce the pressure in the eye is laser treatments. The beautiful thing about these therapies is that they are safe and noninvasive. There is no cutting or incision necessary. The procedure usually only takes about five or 10 minutes, and you will go home the same day as your treatment. Now, occasionally this therapy does not work or sometimes only marginally lowers the intraocular pressure, and the effect can wear off over time, but when laser therapy is seen to work, more treatments can be done to continue your progress. The final therapeutic option is one that doctors have trained tirelessly to perfect. That is surgery. The first and most simple surgical option is called the trabeculectomy. When the drain of your eye, just like the slow drain in your house, doesn't work as well, the doctor will make a hole in the area of blockage to allow fluid to move more easily out of your eye, essentially opening up the drain. In other words, the goal of trabeculectomy is to create a whole new drainage system for the eye. This is currently considered the gold standard for glaucoma surgery. The main drawbacks of this surgery are potential risks of decreased vision and the longterm risk of an eye infection. Fortunately, doctors have special tools available to them that limit these risks. Also, you may not be able to wear contact lenses after this surgery, but, of course, the wonderful aspect of this surgery is that it can successfully help stop the progression of glaucoma. Another therapy that you and your doctor may decide is best is to place a tube in your eye, and that will allow the fluid in your eye to drain to a reservoir on the wall of your eye. Again, this surgery will create a completely new drain for the eye, allowing fluid to drain and prevent the damage to your optic nerve. Additional risks to be aware of with this surgery is the small possibility of double vision, and the minimal risk that the tube, over time, may need to be repositioned. This surgery has similar success rates to trabeculectomy and can significantly put you on the road to stopping glaucoma. More minimally invasive surgical options are now on the horizon that are going to be available to you and will actually restore the outflow of your own drain. What happens after surgery? Well, for a few weeks, your vision may actually be worse, as your eye adjusts and heals, but our goal is, of course, to maintain the vision that you had before surgery. Your vision will most likely not improve, but our goal is to make sure that it doesn't get any worse. The first couple of weeks, you may also have more limited activity than you are used to, but you should only experience mild discomfort as you recover. Recovering fully can take anywhere from one to three months, and you should always check in with your doctor, if you are experiencing any signs that your eye may be infected. Glaucoma is a disease that takes time to take away your sight, and time is in turn our greatest defense against it. That is why it is so important to get your eyes checked regularly, and, if you have the beginning of glaucoma, to talk to your doctor about your options, whether it be medication, laser treatment, or surgery. We are committed to helping you take a proactive stance on glaucoma and hopefully prevent it in you or in your loved ones. Our sight is a beautiful gift. Join the fight against this horrible blinding disease that would try to take it from you now. For more information, please visit our website, voldvision.com. Thank you so much for your time.